The three biggest trends that could drive the industry next year, and a few stocks set to profit from them. 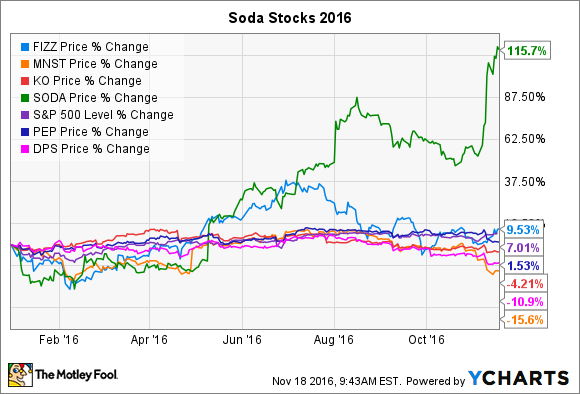 If you invested in soda stocks this year hoping for high returns, odds are that your thirst for gains went unquenched. With just a few weeks left in 2016, the biggest names in the industry, including PepsiCo (NASDAQ:PEP), Dr Pepper Snapple (NYSE:KDP), and Coca-Cola (NYSE:KO), are all trailing the broader market. Even past growth stories like National Beverage (NASDAQ:FIZZ) and Monster Beverage (NASDAQ:MNST) failed to produce significant gains. In fact, eye-popping growth was confined to SodaStream (NASDAQ:SODA), the soda-machine maker whose stock doubled as it turned the business away from soda and focused on sparkling water. Sparkling water promises to remain an important trend for the year ahead, and that tailwind should keep SodaStream in the news well into 2017. The company counts itself as the world's largest fizzy-water brand by volume, with 350 million liters of at-home production last quarter alone. Most of its recent stock-price gains came from a dramatic business turnaround, though. SodaStream began the year posting double-digit declines in soda-machine sales but has since managed over 30% growth in each of the last two quarters. National Beverage is the company behind the LaCroix sparkling water brand, and is also worth putting on your 2017 watch list. Its volume growth this past year accelerated to a 9% pace from the prior year's 1% uptick. By pairing those higher sales with rising average prices, CEO Nick Caporella and his executive team posted a 25% spike in net income. Whereas SodaStream's core challenge is to convince a growing number of households to produce their own sparkling water, National Beverage needs to constantly refresh its portfolio with flavors and package sizes that resonate with consumers. A growing segment of beverage shoppers is rejecting sugar as a key ingredient in their drinks, and the two soda giants, Coca-Cola and Pepsi, are racing to catch up. Coke's new Coca-Cola Zero Sugar brand, for example, posted double-digit volume growth last quarter in the key U.K. market compared to the Coca-Cola Zero product sold earlier. "We know that consumers are looking for less sugar," executive James Quincey recently explained to investors. Similarly, Pepsi is seeing strong demand for its Naked lineup that management attributes to the fact that it has no added sugars or preservatives. The company is now working to apply those lessons across its portfolio. "We are making strides to reduce added sugars in our beverages through reformulation," CEO Indra Nooyi said in late September. A fundamental shift in customer attitudes away from sweet drinks and their traditional diet alternatives has so far left the incumbent soda giants at a loss. Their success at responding to the change with portfolio shifts in 2017 could make the difference between fast overall volume gains or another year of near-zero organic growth. Monster Beverage is another stock to watch for caffeinated growth in 2017. After all, its energy-drink-fueled business has been on a tear lately, with volume up 17% over the last nine months. And, thanks to its distribution deal with Coca-Cola, Monster is squeezing more earnings from those sales. Net profit margin has soared to 24% of sales from 20%, compared with Coke's 17%, Pepsi's 11%, and SodaStream's 7%. Of course, Monster is a far more expensive stock right now. You'll have to pay 34 times projected earnings to own a piece of this business, compared with 29 times for National Beverage and around 20 times profit for most other industry participants. Still, that sky-high valuation is down from the 44 P/E that investors were paying as recently as last summer. And if Monster continues to post market-beating sales growth while improving its profit margin, a year from now investors could look back at today's prices as representing some of the best value among soda stocks.